The most important aspect of your healthy lifestyle is balance. 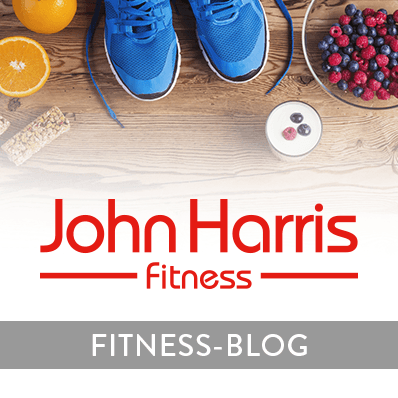 If you don’t have balance, you won’t be able to sustain your results and stay fit forever. That’s why I love healthy recipes that also make you feel like you’re “cheating” a little bit. I created this recipe last year because I wanted a healthy snack to take with me on a hike that included good carbs, protein and healthy fats. So, instead of being super extreme with your diet, try out this recipe the next time your sweet tooth needs some satisfaction. 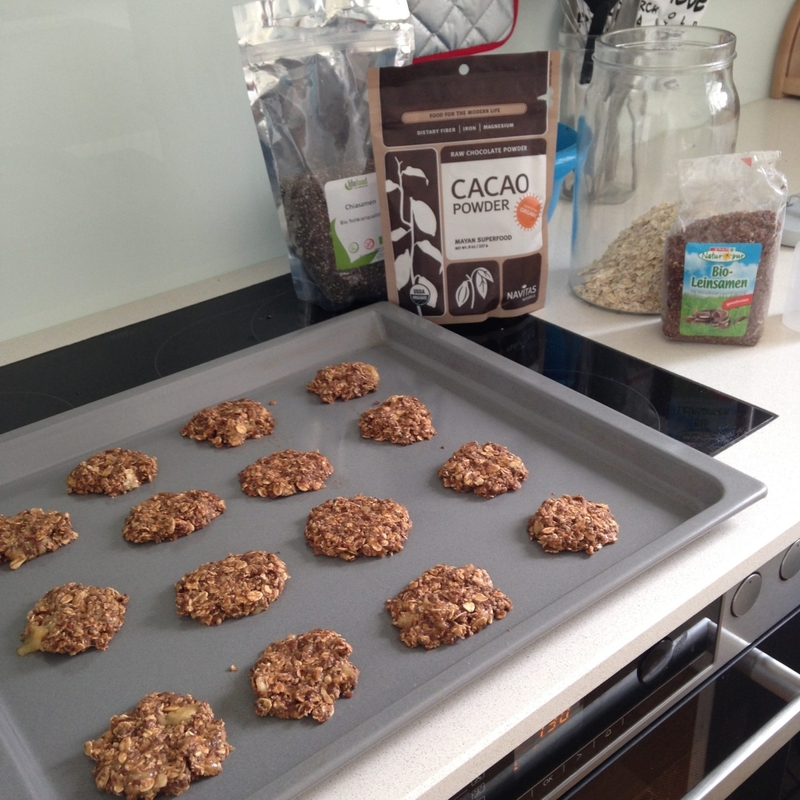 Or, whip these up if you’re heading out for a hike or a bike ride and need a healthy snack to keep you energized. These healthy cookies are super delicious and you only really need 5 ingredients! How easy is that? See how they are made. Mash the bananas with a fork. Then, mix in the oatmeal, flax seeds, chia seeds, cacao & cinnamon. Use a kitchen spoon and make each cookie with one spoonful. Put them on the greased cookie sheet and press them down a bit so they are shaped like a cookie. They will not change form in the oven. Cook at 180 degrees Celsius (350 degrees Fahrenheit) for 12 minutes. This recipe makes 12-15 cookies, which makes them approx. 51 calories each. Enjoy 2 cookies for a snack, and feel free to top them with some almond butter for a little bit extra healthy fats and energy. 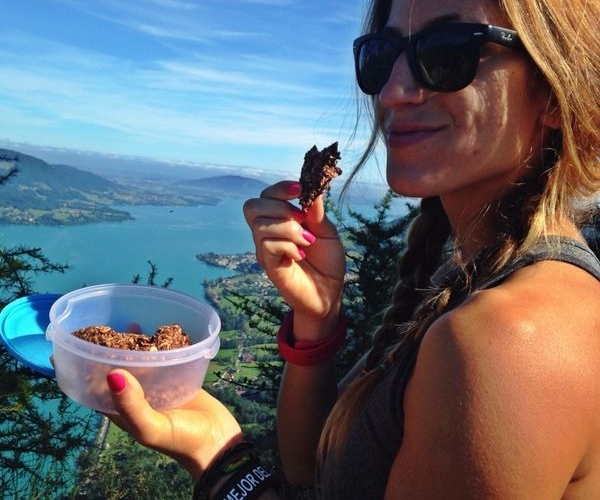 Lunden Souza is a Certified Personal Trainer, Fitness Nutrition Specialist & the Runtastic Fitness Coach. This California native started out as an at-home personal trainer in Orange County, California for 5 years, then moved to work at Runtastic headquarters in Austria in March 2014. She inspires Runtastics worldwide with weekly fitness, nutrition and wellness tips via the Runtastic Fitness Channel on YouTube and her blog. She loves to do yoga, cook, run in the sun and go for long bike rides listening to her favorite podcasts.